This is a blown glass ornament handmade by artists at the Glass Eye Studio in Seattle, Washington. The glass is recycled and contains ash from the 1980 Mt. St. Helens eruption. 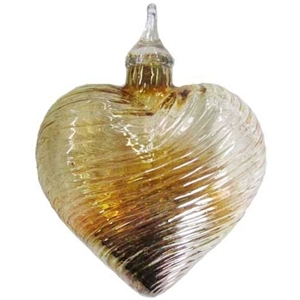 This piece is made with clear glass that has been iridized and gradates from a dark metallic bronze color at the bottom to a light golden color at the top. It has a ribbed texture. The heart is 3" from top to bottom (not including the hanging loop), 3 1/8" at the widest point, and 1 5/8" thick.